So every year I tend to do a quick review on where I am, what I currently do for my clients, what more I can do to support them, as well as looking at where I want my business to go next year. This week for me is my review week, I don’t tend to do it in December and I find it too much of a stress month to add another fairly big task to run with. Not sure about you by December is filled with finding hiding places for all those parcels that have been delivered, explaining why there are several Santa’s around town, remembering to move the elf before I go to bed, school plays, pantos, Christmas dinners, social media, client work etc, so throwing in several client reviews wouldn’t be the best use of productivity in what already is a hectic time of year. I started this week with a quick look at where my business has gone this year, and I must say this year is probably my best yet, I have continued to support my long-term clients, I have gained some truly awesome new clients who are doing amazing things in their businesses, I am so fortunate to be able to support them. I have to say business wise 2017 has rocked for me here at RAS. So, how can I improve on my progress from this year? Like with 2017, I will be setting small realistic targets for next year, it can be so easy to add in so many HUGE and unachievable targets at the beginning of each year, which will only deflate you if you start missing those goals, so instead of giving yourself one massive target break it down into several smaller ones, a bit like your to-do list, this way your confidence in what you do will grow as you hit your goals each month. This year I set myself 4-5 small goals a month, 1 slightly larger one for 6 months and a 1 largish goal for the end of the year, and some of the smaller monthly tasks were heading to my ultimate goal for the end of the year, so I was always seeing my progress as the months ticked on. (this is a real-life goals list from a close business buddy of mine) she set it 2yrs ago, and when I asked her the other week how many she ticked off, she said none! She told me she became disheartened and deflated when the first goal was missed. These were just a couple of hers that she was happy for me to share with you all, you can see the clear difference between the 2 years, she told me that 2015 was negative for her due to the constant missing goals, she quickly realised they were too big and the deadlines were unrealistic. She refused to set goals in 2016! I was talking to her over the weekend and said that this week I was doing my review, she said she would let me know how hers had gone, so yesterday we had a quick live chat, out of the 4 listed above she has completed all of them, she is going into the travel agents on Saturday and laying the deposit for her family holiday next year. She said that her goals were more achievable and realistic deadlines, and with each one she crossed off the more confidence it had given her. Set yourself goals, I actually think they are a healthy thing to have in your business, but don’t expect to move the moon closer to the earth, we already have more pressure on us as it is by running our business, why put more on our shoulders but adding unrealistic goals! Start small and few at a time. 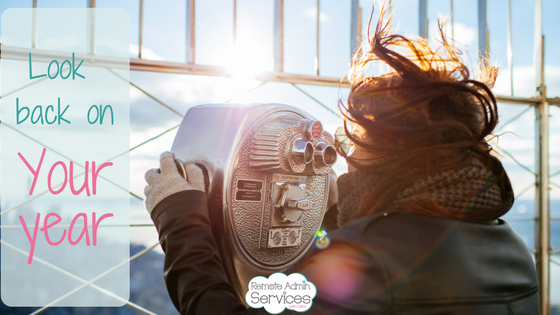 Is 2018 the year for you to offload some of those tasks that are weighing you down? Don’t let it become an issue or too late and your stress levels hit the roof. If you are already working late nights and odd days over the weekend or struggling to knock things of your ever growing to do list, then maybe having a VA on hand maybe the right option for you! ← Are you being Swept away?